What Is a Cross Buck Fence? Does Chain Link or Wood Make a Cheaper Fence? Vinyl fences have grown in popularity because they are low maintenance, easy to install and look good. Once a vinyl fence is installed, it does not need to be treated, painted or repaired due to exposure to the elements, unlike a wood fence. Despite its allure, vinyl fencing carries some clear disadvantages, including cost, lack of strength, eco-unfriendliness, compromised aesthetic value and nonrepairability. Depending on where you live, vinyl fences may not be the solution. One disadvantage of vinyl fencing is the up-front cost involved. According to the Reliable Remodeler website, the initial cost of the vinyl posts, rails and caps will exceed the initial costs of both wood and chain link fences. The amount of difference will depend on a wide variety of factors including height, style and the type of wood used for the wood fence. Conventional vinyl fencing is not as strong as other types of fencing. Vinyl cannot withstand impact like wood fencing, and lack the flexibility to absorb impact as chain link fences do. Vinyl fencing can also become brittle when exposed to extreme temperatures (at least 100 degrees). It is not recommended for areas with constantly high temperatures and direct sunlight Vinyl fencing can actually bend or rails can become dislodged when hit with strong gusts of wind. Prolonged exposure to gusty winds can cause permanent damage. Vinyl fencing faces another disadvantage in the event of breakage: Because the pieces fit and snap together, they are not attached securely with nails or bolts like wood or chain link fencing and break more easily. When they do, they are not repairable, and the homeowner is faced with the cost of replacement of an entire fence segment. Vinyl fencing comes in several styles, but they all share one disadvantage: they look cheap and flimsy compared to the wooden fencing they were designed to resemble. Even a simple wood fence takes on the patina of age gracefully, while vinyl fencing is battling wind and mildew. For ranch-style or vintage homes, vinyl fencing can be a jarring and unfortunate "improvement". Vinyl fencing is made from a plastic composite, which is not as eco-friendly as fencing from a renewable resource like wood. Don't install vinyl fencing in areas where it will constantly be exposed to water and moisture, because mildew is likely to strike. If a sprinkler is used on the lawn, place it away from the vinyl fence. If mildew appears and is not removed quickly, it will stain the vinyl permanently. Stubborn mildew requires bleach or other non-eco-friendly chemical cleaners for removal and prevention. Patrick Williamson has over seven years experience in management, as well as extensive experience in auto mechanics and general maintenance. He focuses his writing on topics that are familiar to him including education, parenting and home repair. Patrick graduated in 2002 with a degree in management. 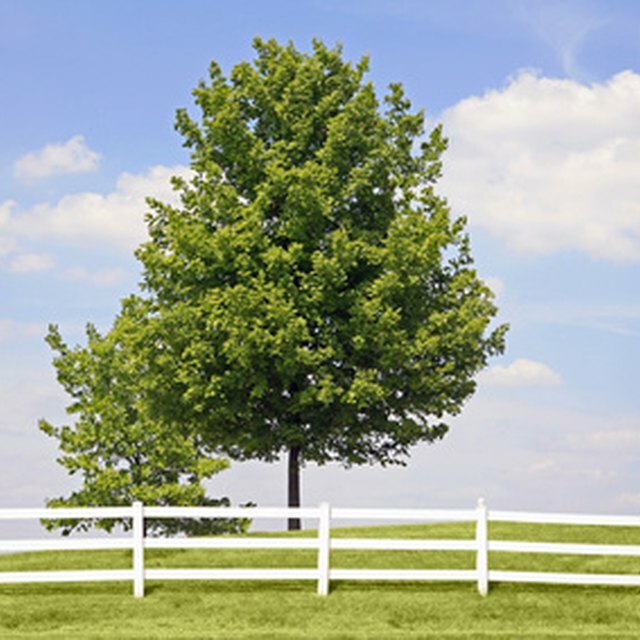 How Much Does a Wood Fence Cost? How Much Does a Split Rail Fence Cost? How Do I Whiten Vinyl Trim?